Several residents of a San Jose neighborhood gathered Monday night to voice their objections to a planned solar project at a nearby elementary school that they say will ruin the view from their homes. The solar panel structure at Ernesto Galarza Elementary School in the Willow Glen neighborhood will stand 16 feet high and follow a fence line for 300 feet at the campus on Bird Avenue and Willow Glen Way. Construction is set to begin in November. But residents on Willow Glen Way were fighting back Monday evening during a special meeting with the school district. Steven Graham, who has lived across the street from the school for 13 years, said the array will change everything. "It will completely obstruct my view and be like living behind the bleachers of a football stadium," he said. 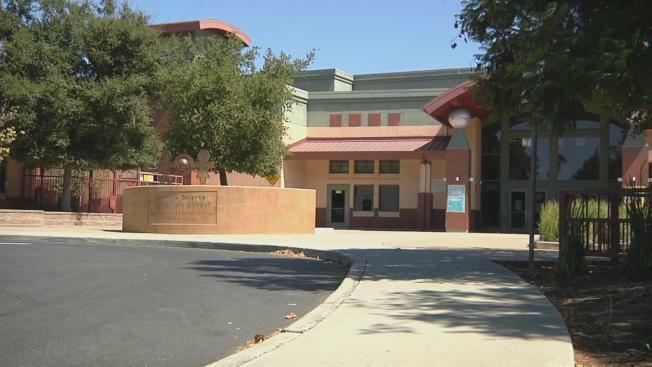 The San Jose Unified School District said it is planning to put up solar structures at 25 elementary schools. At Galarza, the panels would save about $2 million in energy costs over 25 years, the district said. Graham not against solar energy; he even has panels on his own home. But he questioned the location of the structure and asked why it couldn't be built on the roof of the school. District spokesman Peter Allen said cost is an issue with a rooftop solar panel project. "If we had to do the design piecemeal on the roof and the parking lot, that would cost the district quite a bit more," Allen said, adding that it would add about $150,000. Allen also said if the panels were built in the parking lot, the district would have to remove trees. According to Graham, at least 70 neighbors have signed a petition sharing concerns about the project. "My interest is in keeping the open space aspects of this neighborhood intact," Graham said. The district said the location of the solar panels is not a done deal. Administrators will listen to input from neighbors, review other options and then make a decision, likely before the end of October.